Welcome to Galactic Lore, a galaxy of adventure awaits. It's a new year, and time for me to return to this blog. I've spent enough time lost out in real life. Time to jump back into the lands of fiction. But first I have to share a little bit about the new gadget in my life. I've been watching the e-reader scene for the last few years, staying out on the sidelines thinking how they could be cool but not quite enough for me to put my money down on one. That changed once I discovered the NookColor. It's more of an e-reader/tablet than the Kindle or older Nook with their e-ink screens. (Those are neat in their own right, but don't quite capture my inner-geek). 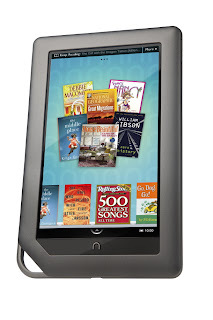 The nook features a bright LCD touch screen that is easy to read from and is glare resistant. So far I've read a couple magazines and one complete novel and I'm really enjoying it so far. I especially like the ability to stream music from Pandora through the device while I read (it has both a speaker and an ear-phone jack).